The increased interest of African Americans in Islam has become one of the most confusing phenomena related to the spread of Islam in the United States. By and large, Islam is stereotyped by many students of religion and society as being a religion that has prejudiced black people. The voice of the advocates who negatively interpret the relationship between Islam and black people is becoming louder. Moreover, in spite of the quite higher conversion rate, the percentage of African Americans who hold an unfavorable view of Islam is dramatically higher than that of white people. For this reason, Muslims are responsible for illustrating why Islam greatly attracts Africans, African Americans and in fact people of all races and ethnicities. Imam Zaid Shakir, the prominent American Muslim imam, sheds insight on race and Islam in the light of the attitude of Prophet Muhammad (pbuh) towards African people. What does the color black connote to us? Zaid Shakir lays a special emphasis on the effects of language on the systematical formation of ideas and thoughts. He states that the negative connotations associated with ‘black' or ‘blackness' in the English language have helped the formation of negative thoughts about race and color in America. Thus, the negative association of the word "black" leads to a psychological tendency to attribute negative values to everything that can be characterized by "blackness", including people. Negative connotations, as well as the names, signs and stereotypes associated with blackness are used to categorize people throughout the colonized world and strengthen ideas of inferiority and superiority in racial and religious affairs in America. This process of negative ‘signification' provided the basis for Europeans to enforce ideas of superiority. From a literal perspective, it is possible to see a number of positive and non-prejudicial connotations associated with color and race in the Arabic language. Moreover, within the context of religious symbols, black as a color also has many positive connotations in the Islamic worldview, for example the black covering (al-Kiswa) of the Ka'aba (Bayt Allah) and the black stone on the House of Allah, the al-Hajar al-Aswad. This is the only object that Muslims are allowed to kiss as an act of worship. Thus, language and symbols help shaping the way we perceive reality. Arabic, the language of the Qur'an and the Qur'anic message itself lay the groundwork for positive associations with the color black. Being free from racial prejudices, the Qur'anic message attracts a great number of people from all races and ethnicities "along with the loftiness of prophetic practice". Shakir throws light on the prophetic practices to better understand the attitude of Islamic teachings towards racism; he takes in hand a few representative verses from the Qur'an and a few Prophetic practices. In the Qur'an Allah says: "O Mankind! Surely we have created you from a single pair, a male and female. We then made you into nations and tribes that you come to know one another [not that you despise one another]. The most noble of you with God is the most pious" (49: 13). This verse lays emphasis on a person's piety as being that which is meaningful with Allah rather than personal features, ethnicity and nationality. According to Islamic principles, racial or tribal background does not give anyone an advantage. In other words, no one person is intrinsically superior to another. We are all the descendants of Adam and we were all created from dirt. The strength of our religious belief and our conscious behavior, aware that Allah is watching over us, are what make us distinguished. In the light of a hadith, it is possible to see how Islam removes race and financial status, the two leading sources of external differentiation in human societies, and emphasizes two distinctive qualities, righteous deeds and the state of the heart: "Verily, God does not look at your external forms or at your wealth. Rather, he looks at your deeds and your hearts." In addition, we are encouraged by the Quranic message to be pleased with our unique hue because that is not a sign of a particular race, but rather the diversity of people's colors is one of the signs of Allah: "Among His signs is the creation of the heavens and the earth, and the variation of your languages and complexions. Surely in this are signs for knowledgeable people (Quran 30: 22). Islam never treats physical differences as a reason for racial distinction or prejudice. Indeed, it is Satan who claims ascendancy over Adam on the basis of his physical characteristics. Satan refused to prostrate himself to Adam, saying "I am better than he. You created me from fire, while you created him from clay" (Quran 7: 12). Thus, Satan was the first racist in history and every racist, regardless of their religion, is following in the cursed footsteps of Satan. The attitude of Prophet Muhammad towards race and race relations can be illustrated by examining his most beloved and closest companions. His adopted son Zayd b. Haritha, who was known as Hibbu Rasulillah (The Beloved of the Messenger of Allah) due to the great love the Prophet (pbuh) felt for him; Zayd b. Haritha was a black Arab. Baraka bint Tha'laba (Umm Ayman) who became a servant of the Prophet after his mother died and whom he freed after his marriage to Khadijah, was a black woman of Ethiopian descent. These two, Zayd b. Haritha and Umm Ayman married and had a child, Usama, who was known as Hibbu Hibbi Rasulillah (the beloved of the beloved of the Messenger of Allah). Like his mother and father, Usama was also black. The Prophet adopted this boy; thus, the boy he called his son and the woman he called "mother" after the death of his biological mother were black. Together with the affection and respect he had for many other black companions, these examples are the most obvious indication of the attitude of Prophet Muhammad (pbuh) towards race. Prophet Muhammad also maintained his positive attitude towards race in public policies. He assigned some of his black Companions to the highest positions. Bilal, a black man of Ethiopian lineage, held the most esteemed public office in Islam, becoming the first muezzin. Another conscious policy undertaken by Prophet Muhammad for the good of Muslim society was his practice of marrying his black companions to women from noble Arab families. These were intentionally planned marriages to try to eliminate racial prejudices and class discrimination in the society. "An example of such a marriage is that of Zayd b. Haritha, who we have previously mentioned, to Zaynab bint Jahsh, before her marriage to the Prophet, Peace and Blessings of God upon him. Zaynab was an exceedingly beautiful and refined Arab woman of noble lineage and exalted character. She was a relative of the Prophet, being the daughter of his paternal aunt, Umaymah. Here she was being called to marry a black man who had formerly been enslaved. She resisted the idea of marrying Zayd until the issue was addressed by revelation, It is not becoming of a believing man or woman, once God and His Messenger have decreed an affair, to follow their own choice. After learning about this verse, Zaynab agreed to marry Zayd. Their marriage addressed both the class and race-based prejudices that were prevalent in Arabian society at that time." Undoubtedly, there are other examples of the practices of our Prophet, such as sending his Companions to Ethiopia to live under the protection of the just ruler, the Negus. All of these examples clearly indicate the attitude of the Prophet towards race and race relations. The underlying cause of the increased interest of people from all races and ethnicities in Islam is that these divine teachings attempt to eliminate the negative attitudes and prejudices that give rise to racism. "During the past eleven days here in the Muslim world, I have eaten from the same plate, drunk from the same glass, and slept in the same bed (or on the same rug) - while praying to the same God - with fellow Muslims, whose eyes were the bluest of blue, whose hair was the blondest of blonds, and whose skins were the whitest of white. And in the words and in the actions and in the deeds of the ‘white' Muslims, I felt the same sincerity that I felt among black African Muslims of Nigeria, Sudan, and Ghana. We were truly all the same (brothers) -because their belief in one God had removed the ‘white' from their minds, the ‘white' from their behavior, and the ‘white' from their attitude. Zaid Shakir is one of the prominent Islamic scholars in the United States and teaches Arabic, Law, History and Islamic Spirituality. Born in 1956, Shakir in California he became a Muslim in 1977. He has studied International Relations at the American University, earned his MA in Political Science from Rutgers University. He studied Arabic and Islamic sciences for seven years in Syria and is the first graduate of the prestigious Abu Nour University. He gives lectures around the world and is chosen one of the most influential Muslims in the world. 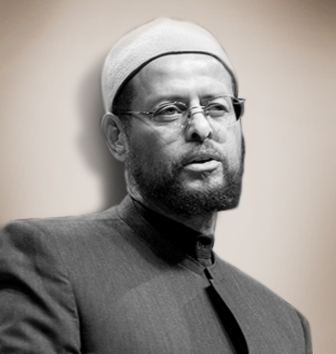 Imam Zaid Shakir was born in Berkeley, California and he accepted Islam in 1977 while serving in the United States Air Force. He obtained a BA with honors in International Relations at American University in Washington D.C. and later earned his MA in Political Science at Rutgers University. While at Rutgers, he led a successful campaign for the disinvestment from South Africa, and co-founded a local Islamic center, Masjid al-Huda. After spending a year in Cairo, he became a lecturer in Political Science at Southern Connecticut State University in New Haven, Connecticut, a position he held until 1994. As Imam of Masjid al-Islam from 1988 to 1994 he spearheaded a community renewal and grassroots anti-drug effort, also teaching political science and Arabic at Southern Connecticut State University. He then left for Syria to pursue his studies in traditional Islamic sciences. For seven years in Syria, and briefly in Morocco, Imam Zaid Shakir immersed himself in an intense study of Arabic, Islamic law, Qur'anic studies, and spirituality with some of the top Muslim scholars of our age. In 2001, he graduated from Syria's prestigious Abu Noor University and returned to Connecticut, serving again as the Imam of Masjid al-Islam, and writing and speaking frequently on a host of issues. That same year, his translation from Arabic into English of The Heirs of the Prophets was published by Starlatch Press. In 2003, he moved to Hayward, California to serve as a scholar-in-residence and lecturer at Zaytuna Institute, where he now teaches courses on Arabic, Islamic law, history, and Islamic spirituality. He is a frequent speaker at local and national Muslim events and has emerged as one of the nation's top Islamic scholars and a voice of conscience for American Muslims and non-Muslims alike. Zaid Shakir is amongst the most respected and influential Islamic scholars in the West. As an American Muslim who came of age during the civil rights struggles, he has brought both sensitivity about race, poverty issues and scholarly discipline to his faith-based work. Please type '219' into this field. Zaid Shakir is one of the prominent Islamic scholars in the United States and teaches Arabic, Law, History and Islamic Spirituality. Born in 1956 in Berkeley, California, Shakir accepted Islam in 1977 while serving in the United States Air Force. He obtained a BA with honors in International Relations at American University in Washington D.C. and later earned his MA in Political Science at Rutgers University. While at Rutgers, he co-founded a local Islamic center, Masjid al-Huda. For seven years in Syria, and briefly in Morocco, he immersed himself in an intense study of Arabic, Islamic law, Quranic studies, and spirituality with some of the top Muslim scholars of our age. In 2001, he graduated from Syria's prestigious Abu Noor University and returned to Connecticut, serving again as the Imam of Masjid al-Islam, and writing and speaking frequently on a host of issues. In 2003, he moved to Hayward, California to serve as a scholar-in-residence and lecturer at Zaytuna Institute, where he now teaches courses on Arabic, Islamic law, history, and Islamic spirituality. He is a frequent speaker at local and national Muslim events and has emerged as one of the nation's top Islamic scholars and a voice of conscience for American Muslims and non-Muslims alike.